Public transport in Peru is — in a word — varied. As an independent traveler in Peru, you could find yourself on a surprisingly luxurious long-distance bus one day, and on the back of a cramped pick-up truck the next. You could be flying over the Andes on Monday, winding your way down the Amazon by boat on Tuesday, and be bouncing down a dirt road in a mototaxi a few days later. The public transport system in Peru — a country twice the size of Texas and much more varied geographically — is an adventure in itself. And to get you started on this sometimes bumpy path, here’s an introduction to all of the different types of public transport you might come across in Peru. As far as I can remember, I’ve only seen tricycles used as public transport in one city in Peru. 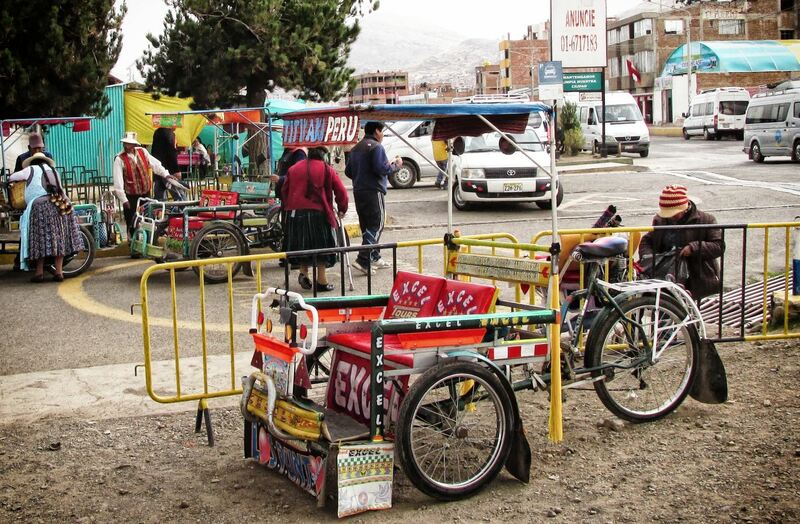 That was in Puno, where colorful but cumbersome-looking pedal-powered tricycles were driven by old men, normally carrying old women or kids as their passengers. A parked tricycle down at the harbor in Puno, Peru. Photo by Tony Dunnell. Taxis in Peru are a real mixed bag. Some are black, modern and sleek, with suited drivers who respect the laws of the road. Others are standard yellow cabs driven by chatty men who like to talk about football, women and the weather. Then there are four-wheeled death traps studded with dents and driven by men who probably shouldn’t be let out of the house (or who probably escaped from prison). You’ll find all three in most of Peru’s major cities, but with far fewer in the jungle regions, where mototaxis (see below) greatly outnumber regular taxis. 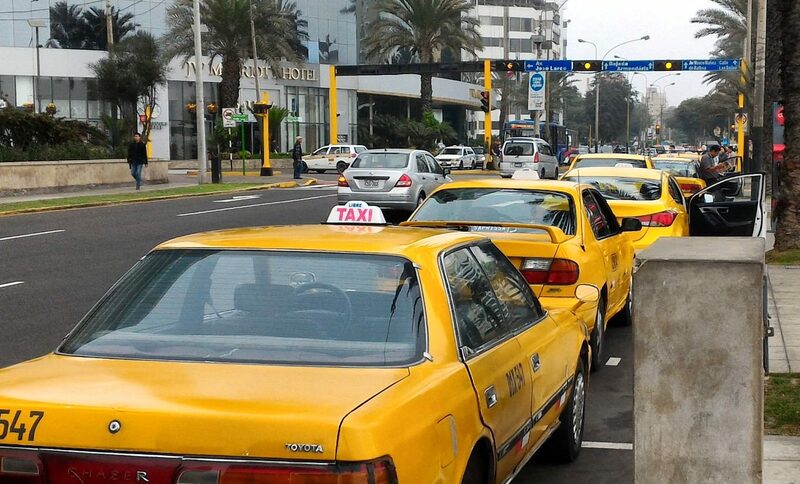 A taxi rank in Miraflores, Lima. Photo by Tony Dunnell. The word colectivo is used in various ways, but typically refers to any small vehicle — normally a car, van or minibus — that runs along a set route and functions as a shared taxi. A colectivo vehicle runs from a “terminal” known as a paradero, from where it leaves for specific destinations. Colectivos typically leave when they’re full; that’s three or four passengers in a shared car, or more in a van or minibus. If there’s room on board, you can flag down a colectivo in the street. Micros and combis (see below) can be considered colectivo services. A colectivo service might function within a city; between cities and outlying villages; or even over long distances between cities (for example, the colectivo shared taxis of Pizana Express, which run between Tarapoto and Tingo Maria). Colectivos run on set fares. 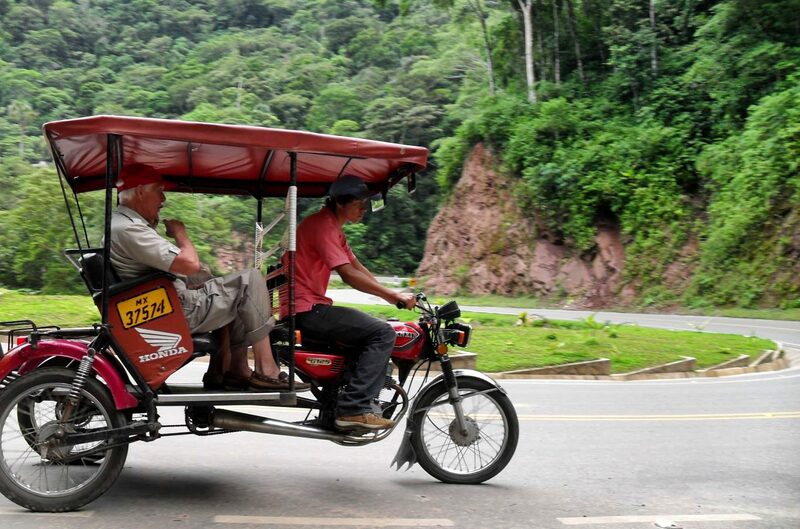 Mototaxis are an iconic part of Peruvian life, especially in the jungle, where motorbikes and mototaxis far outnumber cars. Mototaxis, which are similar to rickshaws in India, can zip you across cities like Tarapoto, Yurimaguas and Iquitos for just a few soles. They can carry two to three people (legally, at least). As with regular taxis, you need to negotiate the fare in advance. Mototaxis also operate just outside of the cities on country roads. Be careful on rougher roads, however, as mototaxis can tip over if they overbalance. A mototaxi winding its way down a jungle road towards Tarapoto, Peru (with my dad in the back seat!). Photo by Tony Dunnell. Traveling by camioneta can be fun for about 10 minutes, until your legs begin to ache, your backside goes numb, and the person next to you starts to lose consciousness. Camionetas are pickup trucks — some new-ish, some very old — that carry passengers in the cargo area. If the cargo area is packed, everyone stands for the duration of the trip. If there’s some breathing room, you might find a place to sit — but that will probably be on the side or on the raised tailgate, which after a while is more uncomfortable than standing. Camionetas provide the cheapest form of public transport in Peru. Avoid whenever possible, unless you’re a youthful masochist. 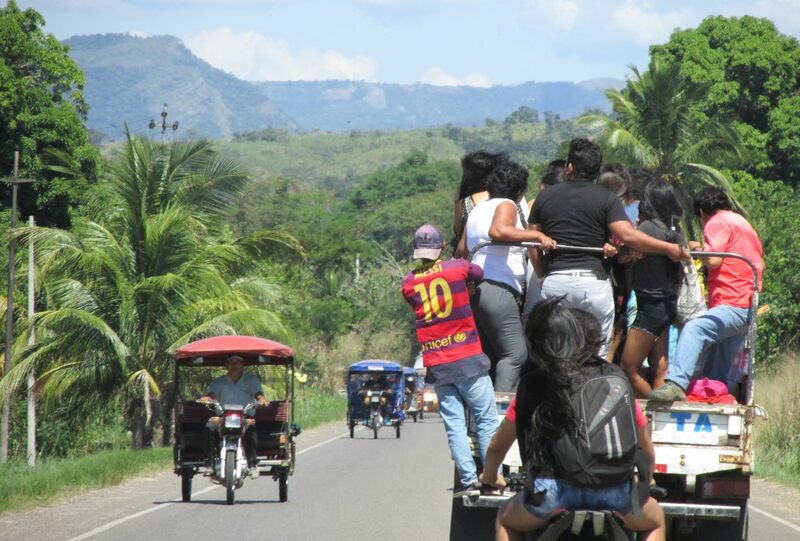 Passengers on a pickup truck on the road outside Tarapoto, Peru. Photo by Tony Dunnell. Minibuses are a fundamental part of the public transport system in some Peruvian cities. And, in most cases, the local government wishes they weren’t — especially in Lima, where micros and combis are a large source of air and noise pollution, traffic congestion, and accidents. The combi is the smallest, most sardine can-like of the two, often being a beat-up Nissan or Toyota minivan/microbus. If you’re over five-feet tall, good luck. The micro is normally an old Toyota or Mitsubishi minibus, and is larger than the combi. Both trundle around along a set route and can be flagged down on any block. You’ll normally see the “ticket collector” hanging out the side door repetitively shouting out the destinations. Combis and micros are chaotic, cramped, and attract pickpockets, but they are incredibly cheap. A combi minibus negotiates its way through the streets of Lima. Photo by Tony Dunnell. 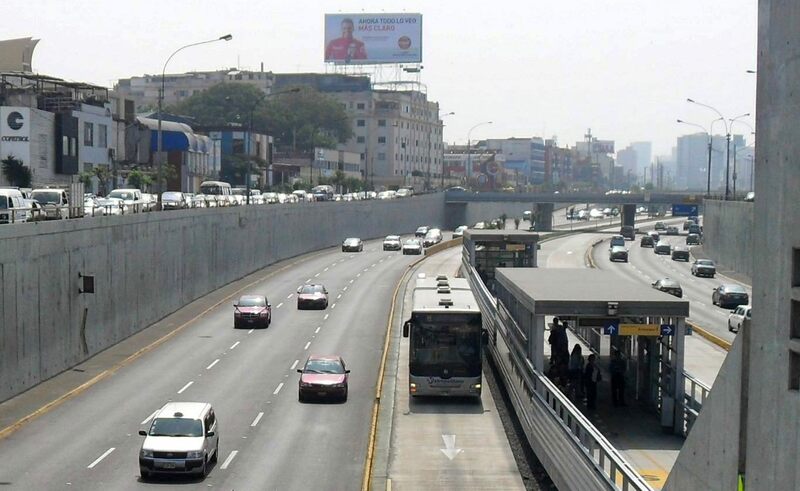 The Metropolitano is Lima’s bus-based rapid transit system. It actually works fairly well and connects most of the districts tourists might want to visit, including Barranco, Miraflores and Central Lima. Once you’ve bought the appropriate swipe card, it’s easy to get around on the Metropolitano. It can get crowded inside the buses, sometimes to the point where it’s hard to even get off at your stop, but it’s still safer than the combis. A bus on Lima’s Metropolitano system stops at the Ricardo Palma terminal on the Vía Expresa. Photo by Tony Dunnell. Peru’s best long-distance bus companies might surprise you. If you think you’ll be sharing a seat with a chicken and a goat, think again. With comfortable fully-reclining seats, air conditioning and onboard movies, Peru’s top-end buses provide a good way to travel in Peru on a budget. Travel times can be long, however, so it’s worth considering a flight before opting for a 24-hour bus ride, no matter how comfortable the bus. Trains in Peru are limited to the southern half of the country, and the rail system is limited to just a handful of destinations. PeruRail (www.perurail.com) is Peru’s most famous train operator, offering tourist-focused train services between Cusco and Machu Picchu (Aguas Calientes). PeruRail also runs the luxury Andean Explorer between Cusco and Puno. The Ferrocarril Central Andino (www.ferrocarrilcentral.com.pe) runs from Lima to La Oroya in the central Andes, where the tracks split: one heads north to Cerro de Pasco and the other south to Huancayo and Huancavelica. It is the second highest railway in the world. A tourist service runs about twice a month between Lima and Huancayo. Finally, there’s the Ferrocarril Tacna Arica, Peru’s only international train service, which lay dormant for many years. It’s a tourist service with just one carriage, offering one-hour thirty-minute rides across the Peru-Chile border from Tacna to Arica. 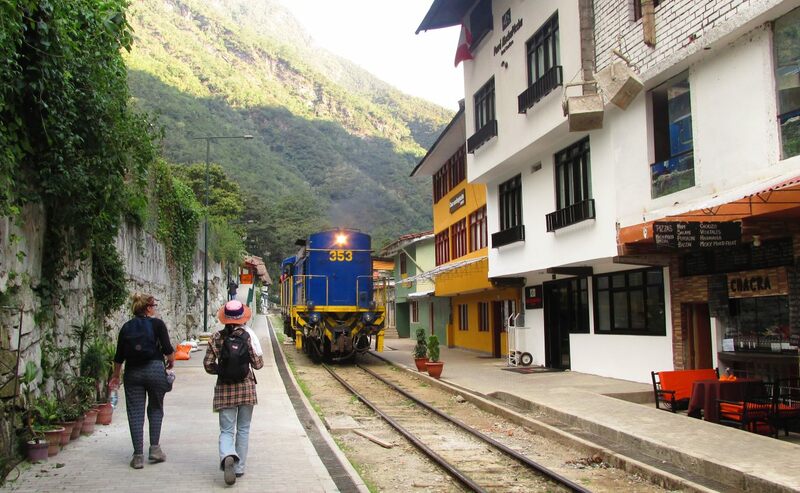 A PeruRail train arrives in Aguas Calientes near Machu Picchu. Photo by Tony Dunnell. Only one cable car system (teleférico in Spanish) exists in Peru, and that started operating in early 2017. It was built to improve access to Kuelap Fortress, a magnificent archaeological site near Chachapoyas in northern Peru. Domestic airlines in Peru do a pretty good job of connecting the country’s major cities (and some minor cities). The arrival in early 2017 of a new budget airline, Viva Air Peru, looks set to shake up the entire market, hopefully driving prices down across the board. Large passenger boats (lanchas) ply the river routes of the Peruvian Amazon. They also carry plenty of cargo below decks, and sometimes you get the feeling that the cargo is more important than the passengers. But still, it’s a fun way to travel for adventurous backpackers, who can pay for hammock space on the main passenger deck, or pay a little extra for a tiny cabin. The two main river routes are from Yurimaguas to Iquitos and Pucallpa to Iquitos. 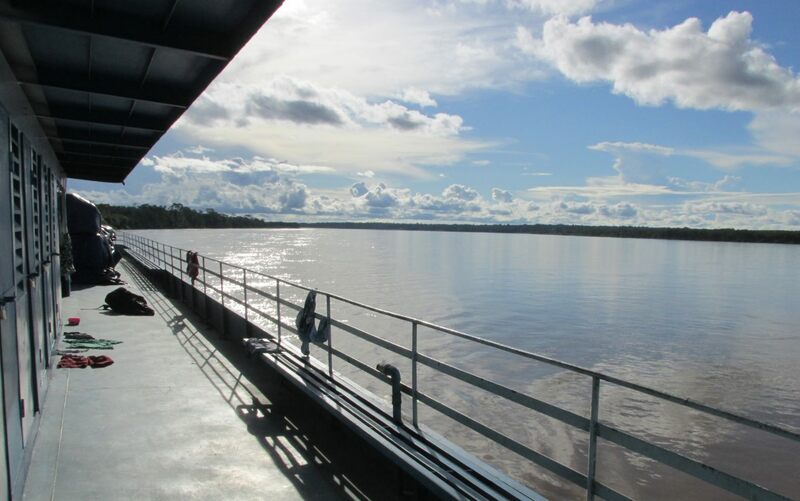 The view from the top deck of a large river boat on the Peruvian Amazon. Photo by Tony Dunnell. A lancha rapida (or sometimes delizador) is a long and narrow boat with an outboard motor, used for much faster travel along Peru’s river system. They’re great for short hops and are common around Iquitos and Pucallpa. You can also travel long distance by lancha, but expect to pay significantly more than you would for a large passenger boat. More Public Transport in Peru? 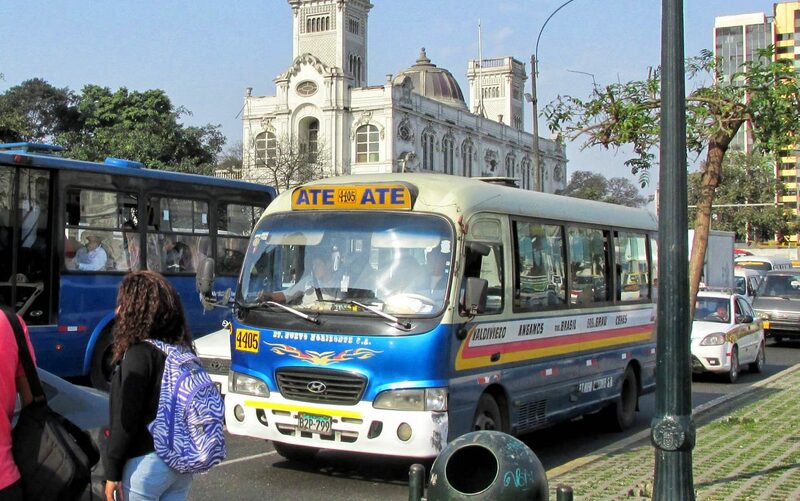 Have you traveled by any other type of public transport in Peru not included in this article? If you have, let me know in the comments section below. Thanks!